This article is a short summary of Super Mario 3D Land. Super Mario 3D Land is a platformer Super Mario series game released on the Nintendo 3DS. Developed by Nintendo EAD Tokyo, the same team who developed the Super Mario Galaxy games and Donkey Kong Jungle Beat, Super Mario 3D Land combines 2D and 3D elements of Super Mario series games. Additionally, the game is the first original 3D Mario platforming game to be released on a handheld device. A follow-up game, Super Mario 3D World, was later released for the Wii U in 2013. Mario leaps into a new dimension! Mario returns to his roots in an all-new adventure in 3D! Platforming with serious depth! With the 3D visuals of Super Mario 3D Land, players can see exactly where floating ? Blocks and flying Paragoombas are, so that they can jump and stomp with the precision of the pros. Expert gamers will appreciate the way 3D graphics reveal the true challenge of the levels, so that they can focus on nailing the perfect jump or shaving precious seconds off their speed runs, while new players will find that 3D makes platforming simple to grasp and satisfying to master. Try on Mario's Tanooki Suit, and put some spring in your step! While longtime gamers will delight in using Tanooki Mario's tail-spin attack to sweep enemies off their feet and fluttering through the air to land super-long jumps, a new generation will learn what makes this classic suit a fan favorite. But even seasoned players will be in for a surprise--Mario's enemies may be sporting the familiar Tanooki tail too! Mario at his very best! Mario returns to his roots in his first 3D platforming adventure designed exclusively for a handheld system. From the frantic race-against-the-clock dash through the Mushroom Kingdom to that final leap to grab the top of the flagpole, this eye-popping addition to the Super Mario series combines everything that makes Mario great from one generation to the next. On one night, a huge storm hits the Mushroom Kingdom, blowing all the leaves off of the Tail Tree outside Peach's Castle. The next morning, Mario finds that the leaves have been blown off the tree, as well as a letter from Bowser showing that he has once again kidnapped Princess Peach. Mario sets off on an adventure to rescue her. The gameplay of Super Mario 3D Land takes the same basic gameplay as previous 3D Mario games and combines it with structure and gameplay elements of a 2D Mario platform game. Most of Mario's movements as seen in previous 3D games are still present, though some, such as the double jump and triple jump, have been removed. A run button has also been implemented, which also takes from the 2D games. Instead of collecting Power Stars, Mario is instead tasked with reaching the Goal Pole in a certain time limit, like with the 2D games. Permanent power-ups have also been implemented like with the 2D games, such as the Super Mushroom, Fire Flower, Super Star, the new Boomerang Flower, and the Super Leaf, returning from Super Mario Bros. 3; as such, the series staple blocks are also more prominent in this game. Having the same structure as a 2D Mario game, the levels have been made more linear. The Nintendo 3DS's steroscopic 3D effect has also been implemented in this game, with the goal of making 3D movement and jumping easier. 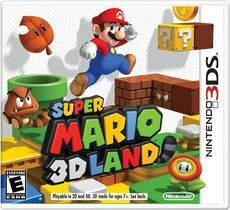 Super Mario 3D Land was developed with the mentality of "resetting" the conventions of 3D Mario games, which so far were all for home consoles, and making a game that would be able to introduce players who played the 2D Super Mario games to the 3D games by bridging them. The levels were designed more compact and linear so that they would be more suitable for a handheld game, allowing players to pick up and play in bursts. Due to the 2011 Tōhoku earthquake and tsunami and the resulting radiation leak, the EAD Tokyo office was closed, and many developers locked themselves in their homes. To continue working, Koichi Hayashia shared his contact information with the other developers, and an online forum was set up. In order to finish the game in time for the 2011 holiday season, parts of the game were outsourced to other developers, such as Brownie Brown. This page was last edited on 4 November 2018, at 18:43.